Your paid Loyalty Membership will be activated only on successful payment for Loyalty Membership made through the TabletShablet website. The annual membership fees for Loyalty is stated in the Footer section of our Homepage. This Gold card entitled for Rs. 59 Discount on each Purchase order. This Silver card entitled for Rs. 39 Discount on each Purchase order. Validity of card is for One Year from date of issue. Only registered Email & Phone No. are allowed to get the benefit. The Loyalty Membership fee is non-refundable except as expressly set forth in these Terms. Taxes may apply on either or both of the membership fee and the reduced shipping charges for Loyalty. 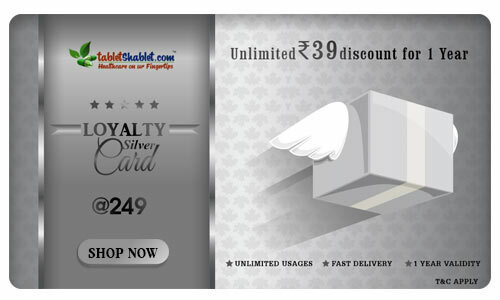 By signing up for Loyalty Membership, you confirm that you are resident of India. You cannot use a credit or debit card issued outside India to pay for any membership fee for Loyalty. You cannot pay for membership fee for Loyalty using POD/Pay on Delivery. Paid Loyalty Membership only becomes effective upon successful authorization of payment. Company can change the Card or Term & Conditions anytime.